Guest Post! Laura Anne Gilman on the origins of ‘Silver on the Road’. 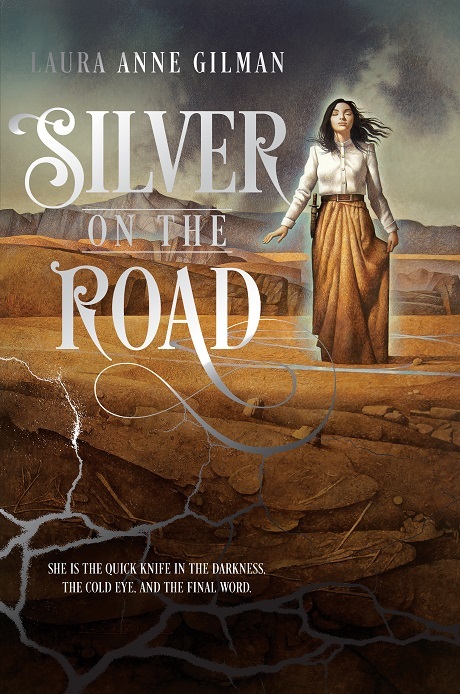 Since I’m going to be madly busy this next week with VATstuff, I’m extremely grateful to Laura Anne Gilman for offering to entertain and intrigue you all with these insights into her new book, Silver on the Road which is already attracting enthusiastic reviews. For those of you yet to discover and enjoy her work, check out Laura Anne’s website. Not only is she a talented and inventive author, her background in publishing means she also talks a great deal of good sense about all aspects of the book trade. So, without further ado, over to Laura Anne! A few years ago, I might have been the last person you expected to write a Western. The genre wasn’t one I particularly favored, despite having personal experience with horses, guns, and sleeping outdoors. Or perhaps because of all that, who knows? But Westerns as a genre didn’t draw me in. And Weird West? I’d read it, liked it, but most of the tropes left me cold. In 2011, I wrote a story called “Crossroads,” followed the next year by “The Devil’s Jack.” They were strange little stories, in a vaguely historical, vaguely high prairie setting. But I quickly realized that the next story – originally called “A Town Named Flood,” wanted to expand into a novel – a novel set in a mostly-recognizable west-of-the-Mississippi North America, circa 1801. “I’m writing a Western?” I asked my agent, somewhat bemused. And magic, so that by default tips it into the “Weird West” category. So… I was writing a Western? Yes … and no. For most of us, the “Old West” calls up images of cowboys and sixguns, of stagecoaches and saloon girls, gold prospectors and cattle ranchers. But those images come from 1820 and later. In 1801… well, I’ll spare you the historical neepery, but the territory west of the Mississippi didn’t look anything like that. But the Western story isn’t only that. It’s the story of our histories, our cultures, and our myths… and I use the plural of those words intentionally. Because America’s history isn’t simply the United States – it’s Canada and Mexico as well, started long before the first European immigrants landed on the eastern (or southern) shores, and our shared identity is not simple one, the pot only half melted together, and half clumped together stubbornly, parts overbaked and the others still painfully raw. SILVER ON THE ROAD is a fantasy of that North America. Not the quest of empires, or the clash of armies, but the movement of people, and the ever-shifting thing we call a frontier, where one person’s home becomes another person’s hope – and conflict. About dividers and demarcations – and the human urge, and need, to cross over them. And a Western – and yes, Weird West, invoking and involving the tropes of the restless frontier, and twisting it – was, for me, the only way to tell this particular story. So it looks like my agent and I were both right. Previous Post:Diversity in SFF – some thoughts on some recent reports.